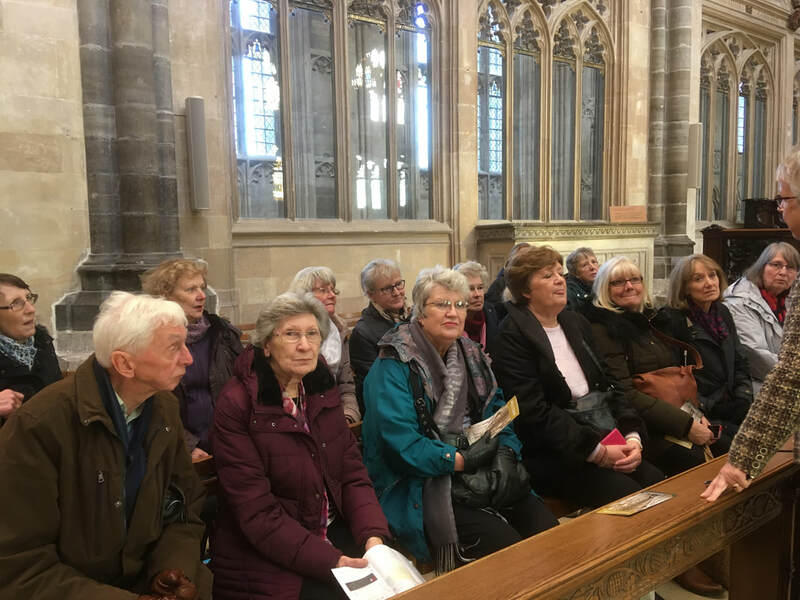 On Friday 30th November we visited Winchester Cathedral, when the weather was surprisingly kind, no rain, sunshine and not very cold. Coffee and cakes on arrival in their tearoom followed by our guided tour of the Cathedral. Winchester was originally the capital of England and the Cathedral which is one of the largest cathedrals in Europe with parts dating back to the Norman period was stunning and well worth the visit. St Swithun, Bishop and Patron Saint who died on 2nd July 862 is buried there and we were reliably informed by our guide that there is no truth to the rumour that if it rains on St Swithun’s day, it will rain for 40 days and 40 nights. Jane Austin is also buried there, as well as William Walker, the diver, famous for shoring up the southern and eastern sides of the Cathedral. The Cathedral also houses the Winchester Bible which is the largest and finest of all surviving 12th century English bibles, which was written by a single scribe over 5 years. Following a very interesting tour of the Cathedral we went to the Christmas market full of pretty wooden chalets surrounding an open air ice rink. The market was delightful with an abundance of unique goodies and ideas for presents, food and drink. On Thursday 6th September 35 members of Westerham U3A took a coach to the Salutation Gardens in the medieval town of Sandwich in Kent. The gardens and adjoining house were designed in 1912 by Sir Edwin Lutyens and are regarded as a masterpiece. The garden itself consists of 3.7 acres which is divided into differing areas or 'rooms' to give the appearance of a larger garden. The Jungle Garden was of particular interest with its display of exotic plants. There was also a black and white garden, which could be viewed earlier in the year, a bowling lawn and a wild flower meadow. We were greeted on arrival with drinks and cake and then joined by Sam who has worked as a gardener in the Salutation Gardens for eleven years. We were lucky to have such an excellent guide. Sam was full of enthusiasm, knew the name of every plant in the garden and in some cases even their genetic background! Dahlias are their speciality, particularly dark leaved dahlias of which they have more than a hundred varieties. Sam told us about a flood in 2013 when the River Stour, which flows just outside the entrance gates, burst its banks and the garden was inundated with saltwater to a depth of up to 6 ft. It was thought this would be a disaster but, in fact, this hasn't been the case and the gardens are thriving. Sam's enthusiasm for his work was apparent throughout the whole tour and also when he was telling us the history of the garden and house. He was able to answer the many questions put to him by the enthusiastic gardeners in our group and many notes were taken. Everything went very well on the trip; the weather and journey were good and many of us enjoyed local fish and chips at lunch time. The size of the portions was more than generous even though many of us asked for small sizes. After lunch we were free to explore the town of Sandwich or go for a walk along the river bank. ​ As you can see, on one of the wettest days in May 2018, 17 members of the Architecture Group ventured to the village of Shere near Dorking. After a quick look around the village museum their guide led them past numerous listed buildings, regaling them with stories of their past history. ​Following a brief stop at the church they went on to the White Horse for a very welcome lunch. Luckily the sun came out in time for their visit to Goddards, a house built by Lutyens in 1898-1900, when he was only 29, being a commission by a private charity for a holiday rest home for "ladies of small means". It is considered to be one of his most important early houses, designed in the traditional "Surrey style" and was later enlarged by him in 1910 to a family home. 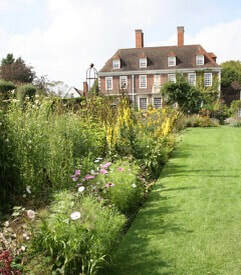 The garden was laid out in collaboration with Gertrude Jekyll of whom he was a great friend. The house is now owned by The Landmark Trust and is used for holiday rentals. Trish Riches, one of our U3A members, recommended and helped to organise a day trip to the Poppy Factory in Richmond and Wimbledon Lawn Tennis Club which took place in April 2018. Having left Westerham by coach the first port of call was the Poppy Factory in Richmond for a very enjoyable and informative, if at times a somewhat emotional, tour of the factory. Whilst having tea and biscuits a guide gave a very good talk on the history of the poppy and the factory itself. The guide was a volunteer but most of the employees are ex-service personnel. This charity was set up to assist ex-servicemen with employment and accommodation. Another aspect of the trip was the opportunity to make poppies to take home. Then on to Wimbledon Lawn Tennis Club for a very nice lunch followed by a guided tour behind the scenes including the players' quarters and the BBC studios and to learn some of the history of the club whilst sitting on Centre Court. Also on view was Henman Hill/Murray Mount and all the work being carried out on the grass courts in preparation for the tournament which begins in July. Lastly a visit to the shop and museum which was very interesting. 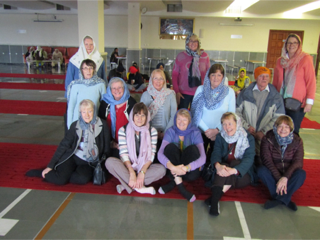 On 12 March 2018 a 90 minute visit to the Sikh Temple at Gravesend, Kent, took place to learn about the youngest and fifth largest world religion. Having removed shoes and covered heads, Deepinder Gill, the guide to the Gurdwara (Temple), gave a tour of her place of worship. She was very knowledgeable and answered all questions. She showed the Sri Granth Sahib (the Holy Scripture) and explained that Sikhism only worships the Creator/God and as God has limitless attributes he has many names e.g. Ram or Allah. To be a Sikh means to be a disciple. All who work for the Gurdwara (Temple) in Gravesend and around the world are volunteers. Sikhism offers to feed everyone who passes their doors. The food (or money) is always donated. It is prepared on the premises and is vegetarian. Sikhs are not vegetarian but catering for large numbers means that vegetarian fare is more practical.